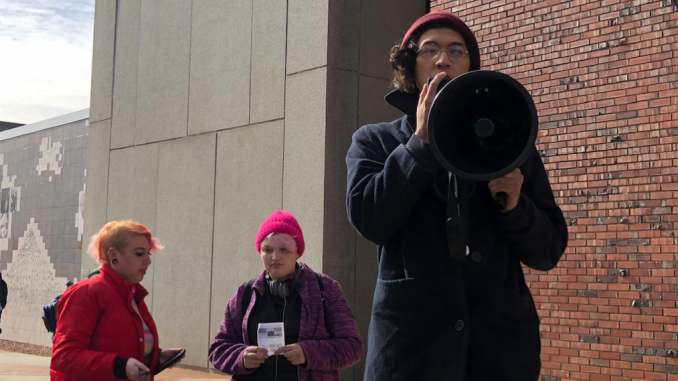 Roughly 150 students rallied in unison at SUNY New Paltz on Friday, Oct. 26, against white supremacist propaganda found plastered on campus and demanded immediate action. At 9:26 a.m., President Donald P. Christian and Associate Vice President for Human Resources, Diversity & Inclusion Tanhena Pacheco Dunn, issued an email to all students regarding their awareness of this particular presence and condemning the messages. “As a community, we have the power to combat these messages of hate and division by continuing to promote education and dialogue and striving, together, toward a more inclusive campus,” the letter read. Founded in 2016, Identity Evropa, a white nationalist group, seeks to recruit college-aged men, in an effort to expand their racial identity movement, according to the Southern Poverty Law Center. Members reject the idea of equality and wish to preserve “people of European heritage” as the “supermajorities in [their] homelands,” according to the organization. The rally was organized by the Hudson Valley branch of the International Socialist Organization (ISO), a national organization that fights social injustices, including exploitation and oppression, in their mission to progress towards a socialist society. The academic concourse rumbled from 1:40 to 2:15 p.m., with echoing chants and adrenalized applause, while both enraged students and passersby shared and listened to speeches, in hopes to spawn change. Several students stepped atop a stone platform, sharing their beliefs on society’s current state of action and awareness. The most popular chants included “No Trump, no KKK, no fascist USA!” and “Whose streets? Our streets! Whose campus? Our campus!” which provoked loud shouts and fueled the crowd. It was even suggested at one point that the college be shut down, if necessary, because “there needs to be change” and “an email is not going to do anything,” said third-year sociology major Kaitlyn Dombrowski. While protesters eventually began to dwindle from the scene, action was still taken. ISO wishes to continue to generate interest towards other organized protests and meetings, according to Hale, which are held every Wednesday at 7 p.m. in Lecture Center 100.